It’s 2016, The Year of Simplicity. Before we get to the FREE gift, I just want to say that I’m beyond grateful for 2015, and to all of you for continuing to support all that I do. I wanted to share with you some of my lessons from this past year, and where I plan to go for 2016. 1. What is THE MOST important thing in my life right now….today? 3. What does ENOUGH mean to me? 4. How am I FUNCTIONING day to day? What BOUNDARIES have I set? 5. What are my GIFTS? These questions led me to realize that the things that make me happy were not my focus areas always each and everyday, and that is not what I wanted. The balance pendulum was way out of whack, and boy did I feel that. As a creative and visionary, I realized that I kept adding and adding on things without letting go of the things that didn’t serve me any longer, and that created chaos in every angle (even a closet full of too many clothes). All of the things that I was teaching everyone day in and day out, all of a sudden was facing me head on. Author Brene Brown talks about authenticity and integrity and of course…vulnerability. I knew I had to be honest with myself and others about feeling a bit overwhelmed and just doing too many things. I knew I had to get back in alignment. I always take pride in being transparent with all of my friends, family members, business partners, clients etc…because we face challenges in our lives, and I truly believe that no one is perfect, including myself. 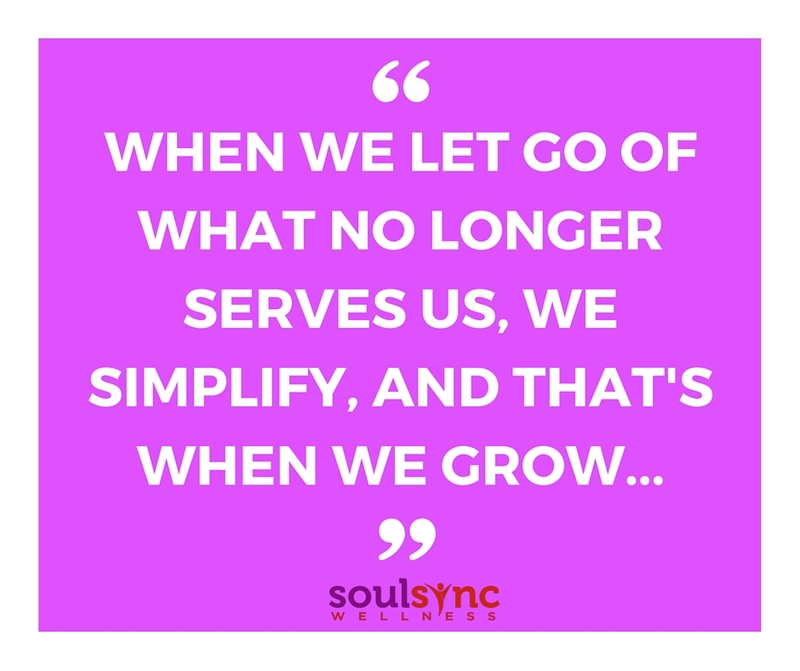 So….I took some time to do this reflection and focus on me, do the necessary inner-work, let go of the guilt, fear, perfectionist tendencies and just do it…This included many things, but most importantly it included ONDAMED biofeedback therapy, energy healings, myofascial release sessions, and spending more time with my family. I also took a step back to reflect on my business focus for 2016, to simplify, gain back my energy and clarity, and I am beyond ecstatic to continue sharing with you all my knowledge and gifts in helping busy people like you live a purpose-FULL and healthier life. Soul Sync Wellness is about helping you strip down all of your layers to get to your core (picture your heart and soul here), re-sync emotionally, spiritually, and physically, gain clarity, confidence, and strengthen who you are so you can live that purpose-FULL and healthy lifestyle that you are meant to live in every way…as a parent, as an employee, as an entrepreneur, as whomever you choose to be. I believe that if you want to lose weight, you have a health issue, you want to look and feel your best inside and out…you have to work on your soul’s core. What does that mean? Answering questions like Who am I? What makes me tick? What do I believe in? How do I want feel? What excuses am I making? What permission am I willing to give myself? 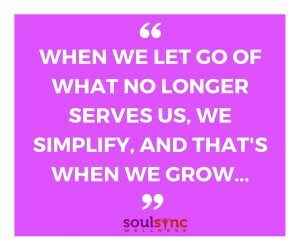 I have a new vision for where Soul Sync Wellness is going, and I will share all of it as it emerges. My one-on-one coaching programs (integrative health, Desire Map, emotional eating, career and life), my Desire map retreats, speaking, and writing more (more guides, more videos, and yes, a book)…I want to get to know each and everyone of you personally, share with you my experiences…my tool box and tricks, and give you my heart and soul. The “year to be” in 2015 was so necessary for me. It was the knot year I needed to untie, so I could evolve into me today…a healthier, lighter, brighter me, and ultimately it was my re-sync year ;-). So…2016…is the year of simplicity because it’s important to be able to balance your family with your passion in life and feel your best. I want to help you do that too! To help, I recommend going through those questions above, but better yet, here is my Soul Sync Core guide FREE to you to get started. The best way to do this is take a week per question (that’s 10 weeks). I would also be happy to set up a free 20 minute session with me to talk about how I can help you in 2016 because…..
Can’t wait to evolve more with you this year, wishing you and your family that 2016 be full of simplicity :-).